March 11th, 1834. – Read in the ‘Sum of Saving Knowledge;’ the work which I think first of all wrought a saving change in me. How gladly would I renew the reading of it, if that change might be carried on to perfection! The outward means, appointed to make the elect partakers of this covenant, and all the rest that are called to be inexcusable. Many are called. – Matt. xxii. 14. The outward means and ordinances for making men partakers of the Covenant of Grace are so wisely dispensed, as the Elect shall be infallibly converted and saved by them, and the Reprobate among whom they are not, be justly stumbled. The means are specially these four. 1. The Word of God. 2. The Sacraments. 3. Kirk Government. 4. Prayer. In the Word of God preached by sent Messengers, the Lord makes offer of Grace to all sinners upon condition of faith in Jesus Christ, and whosoever do confess their sin, accept of Christ offered, and submit themselves to his Ordinances, he will have both them and their children received into the honour and privileges of the Covenant of Grace. By the Sacraments God will have the Covenant sealed for confirming the bargain, on the foresaid condition. By Kirk Government, he will have them hedge in, and holped forward unto the keeping of the Covenant. And by Prayer, he will have his own glorious Grace promised in the Covenant, to be daily drawn forth, acknowledged and employed. 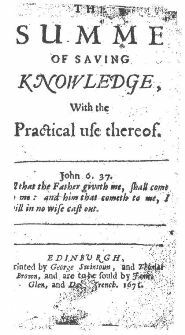 All which means are followed either really; or in profession only, according to the quality of the Covenanters, as they are true or counterfit believers. II. The Covenant of Grace set down in the Old Testament before Christ came, and in the New since he came, is one and the same in substance, albeit different in outward administration: for the Covenant in the Old Testament, being sealed with the Sacraments of Circumcision and the Paschal Lamb, did set forth Christs death to come, and the benefits purchased thereby, under the shadow of bloody sacrifices and sundry ceremonies: but since Christ came, the Covenant, being sealed by the Sacraments of Baptism, and the Lords Supper, do clearly hold forth Christ already crucified before our eyes, victorious over death, and the grave, and gloriously ruling Heaven, and Earth for the good of his own people. The blessings which are effectually conveyed by these means to the Lord’s elect or chosen ones. By these outward Ordinances, as our Lord makes the Reprobate inexcusable, so, in the power of his Spirit, he applies unto the Elect effectually, all saving graces purchased to them, in the Covenant of Redemption, and maketh a change in their persons. In particular, 1. He doth convert or regenerate them, by giving spiritual life to them, in opening their understandings, renewing their wills, affections and faculties, for giving spiritual obedience to his commands. 2. He gives unto them saving Faith, by making them, in the sense of deserved condemnation, to give their consent heartily to the Covenant of Grace, and to embrace Christ Jesus unfained. 3. He gives them Repentance, by making them, with Godly sorrow in the hatred of sin, and love of Righteousness, turn from all iniquity to the service of God: and, 4. He Sanctifies them, by making them go on and persevere in faith, and spiritual obedience of the Law of God, manifested by fruitfulness in all duties, and doing good works, as God offereth occasion. II. Together with this inward change of their Persons. God changes also their state: for so soon as they are brought by Faith into the Covenant of Grace, 1. He Justifies them, by imputing unto them, that perfect obedience which Christ gave to the Law, and the satisfaction also which upon the Cross Christ gave unto Justice in their name. 2. He Reconciles them, and makes them friends to God, who were before enemies to God. 3. He Adopts them that they shall be no more children of Satan, but children of God, enriched with all spiritual privileges of his Sons: And last of all, after their warfare in this life is ended, he perfects the holiness and blessedness, first of their souls at their death, and then both of their souls and their bodies, being joyfully joined together again in the Resurrection, at the day of his Glorious coming to judgement, when all the wicked shall be sent away to Hell, with Satan whom they have served; but Christs own chosen and redeemed ones, true Believers, Students of holiness, shall remain with himself forever, in the state of Glorification.